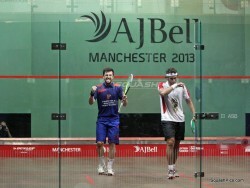 A dazzling performance by 13th seed Daryl Selby in the third round of the AJ Bell PSA World Squash Championship in Manchester will see an unexpected trio of Englishmen contest the quarter-finals of the sport’s premier event of the year which moves to Manchester Central from tomorrow through to the final on Sunday. Selby, the world No14 from Chelmsford in Essex who has never progressed beyond the last 16 in six previous appearances since 2007, dropped the opening game to Karim Darwish as the No5 seed from Egypt looked set to extend his 6/1 career head-to-head lead over the Englishman. 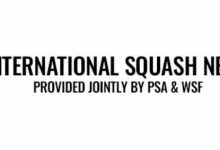 But Selby fought back to take the next two games and move into the lead at theNational Squash Centre. 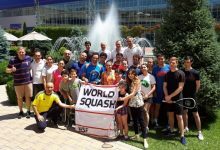 However, the world No5 from Cairo – runner-up in the event the last time it was staged in Manchester, in 2008 – regained control of the game to draw level. 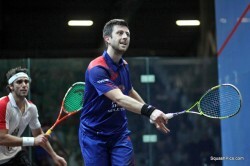 It was nip and tuck through the decider, with Selby reaching 9-6 before Darwish cut back the deficit to 8-9. But two points later and it was underdog Selby who raised his hands in delight after his 4-11, 11-9, 12-10, 8-11, 11-8 victory in 85 minutes – the longest match of the day. “Wow, it’s my first quarter-final of a world championship and what better place to do it than in front of a home crowd – thanks to the crowd for getting behind me tonight,” said the jubilant 30-year-old Selby. “I think when it got close in the fifth the support really made a difference – I really felt the energy and it pushed me through because I didn’t have much left there at the end. “He beat me in a tight 3/1 last year so I guess that’s a little bit of revenge. But he’s a class player – he showed that last week at the US Open – and I’m ecstatic to win. “I like being the underdog, I fight every point,” continued the Essex hero. “I fight every time I’m on court even if it’s not going my way and I don’t feel like I’m hitting it where I want to. He played well the first game, I really struggled. I’ve had two matches on the back courts, he’s had two matches on here – I think that was the difference. Selby’s win ensures surprise domestic interest in three of the four quarter-finals. In the first match of the day, fourth seedNick Matthew survived a hard-fought contest with 11th seed Omar Mosaad, needing 71 minutes to get past the tall Egyptian 11-4, 11-7, 11-13, 11-4. “When it got tight in the third, he became very hard to beat,” said the two-time champion from Sheffield. “I’m lucky I got to a good start in the fourth. 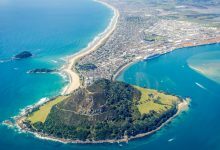 “We play the Nationals here – it’s easier to win that as there are no Egyptians! I love the court, I’m used to it, I’m used to the bounces – it feels home to me and I’m used to the crowd! 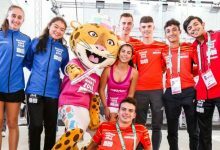 “I had lost a bit of motivation at the end of last season, but I don’t have the skill of James (Willstrop) or Ramy (Ashour) so I work on my tenacity,” Matthew confided to the event MC. 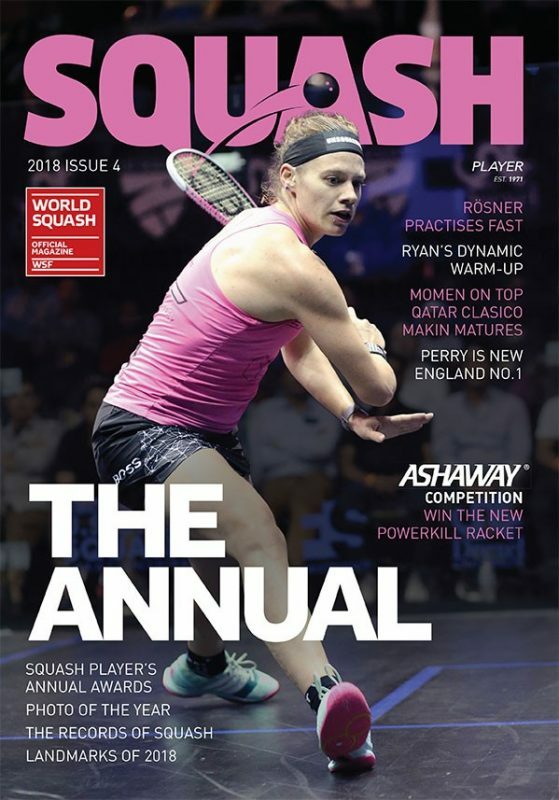 In one of the pick of the last eight clashes, Matthew will take on distinguished Egyptian Amr Shabana, the four-time winner of the prestigious title. Eighth seed Shabana denied Miguel Angel Rodriguez his first time in the quarter-finals when he beat the talented Colombian, the 16th seed, 11-6, 11-5, 11-9 in 37 minutes. “I’m very happy to be in the quarters for the 11th time,” admitted the 34-year-old former world number one from Cairo. 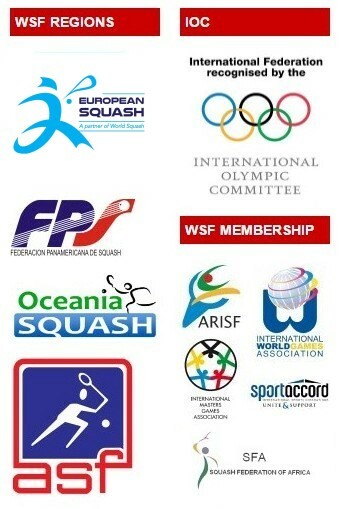 “This is a very high quality tournament, and I’m very proud to be in it. “Miguel is one of those dangerous players – I’ve played him four times now and every time I can feel the sting of his squash, his intensity is getting better, the quality of his shots is getting better, and he is very difficult to beat. 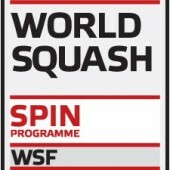 Third seed James Willstrop is England’s other quarter-finalist. The world No3 from Harrogate despatched ninth-seeded Spaniard Borja Golan 11-4, 11-8, 11-6 and will now face Egypt’s No6 Mohamed Elshorbagy in a repeat of last year’s semi-final, which the Egyptian underdog won in a 112-minute marathon. “Borja is in form at the moment, and when you play the top 16 in the world, it’s bound to be tough,” said world No3 Willstrop later. 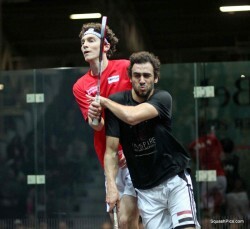 Elshorbagy was on fire as he beat top-ranked German Simon Rosner, the No12 seed, 11-1, 11-9, 11-7. 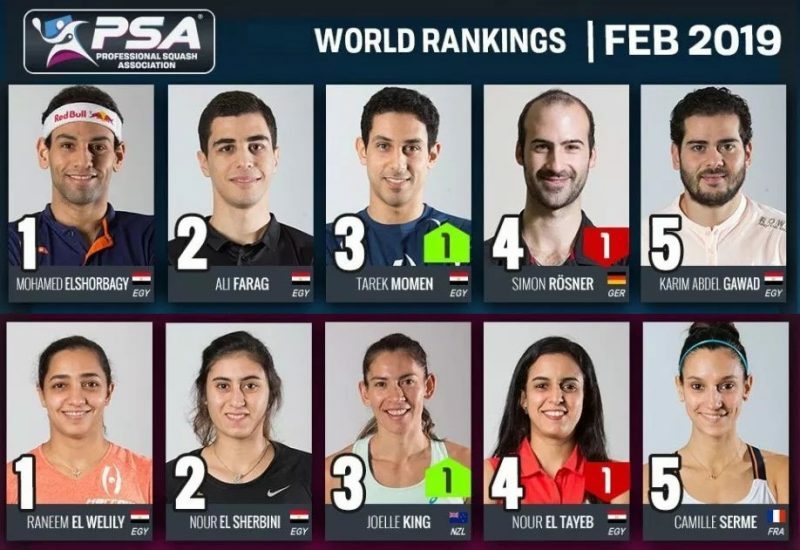 Egypt’s defending champion Ramy Ashour, the world number one from Cairo, secured his expected place in the last eight for the third year in a row when he beat Australian Cameron Pilley. 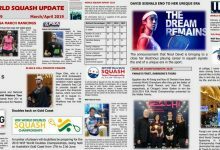 But the 14th seed from New South Wales played one of his best ever matches against the dominant Egyptian and soon opened up a one-game lead. 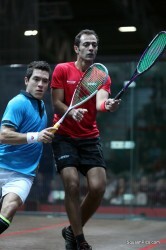 Ashour found his form in the second and third and reclaimed the advantage. 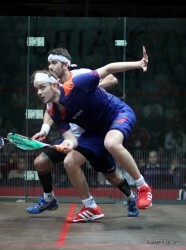 But world No13 Pilley, who had never before beaten his illustrious opponent in eight meetings over the past five years, was not about to lie down – and was a point away from levelling the match at 10-7 in the fourth. 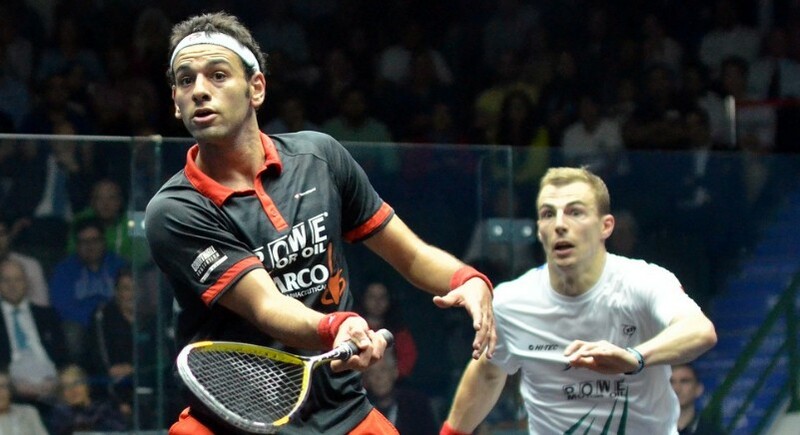 But Ashour clawed back the deficit and clinched his first match ball to win 9-11, 11-8, 11-4, 12-10 in 62 minutes – thereby extending his unbeaten Tour run to 48 matches since May last year. 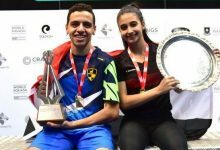 “Cameron played so well, he was finding nicks from everywhere – I was under so much pressure, my shots weren’t going in at all today,” said 26-year-old Ashour. “I had to rely on my fitness to win, and I’m so glad it worked! That win against Cameron gives me a lot of confidence. “I have so much pressure, so many factors – plus that extra enemy up there in my head! Pilley commented: “Apart from a few periods, I played nice lines and lengths, killing the ball at the front as soon as I had the opportunity, keeping the pace up. 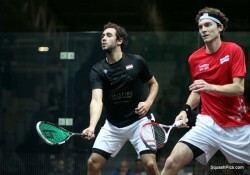 And against Ramy, you’ve got to vary the pace as well. 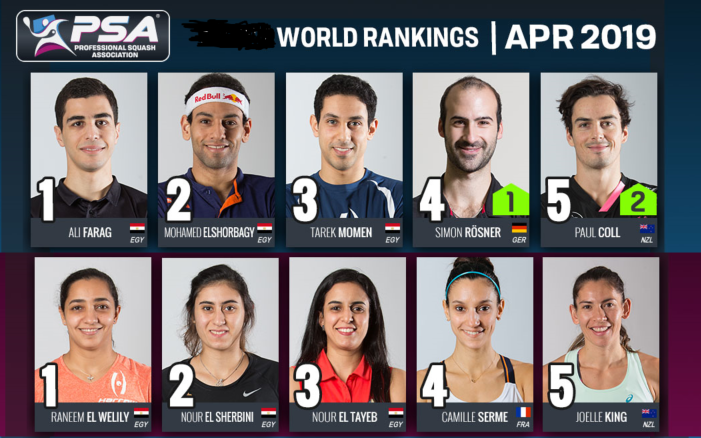 Ashour will line up against India’s Saurav Ghosal – the only unseeded player in the last eight – after the 27-year-old from Kolkata put his name in the squash record books by becoming the first Indian to reach the quarter-finals in the event’s 37-year history. But world No17 Ghosal, widely regarded as one of the fastest players in the Tour, had to fight back from two games down to beat outsider Henrik Mustonen, the world No40 from Finland, 5-11, 8-11, 11-8, 11-4, 11-2 in 66 minutes. 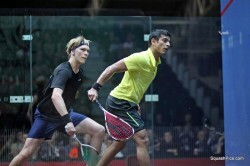 “Henrik played unbelievable squash in the first two games,” said a delighted Ghosal later. “Actually he was match ball down in his first round match and came back to win it – that shows how strong he is mentally. He really caught me off guard with the quality of his shots. I had to dig in super super super deep to grind out of that one. 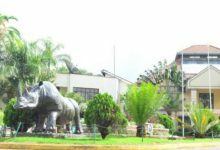 “Personally for me it’s a massive achievement. It’s the first time I’ve made it to the quarter-finals of the World Championship and it’s huge to be in there in the last eight with the world’s best players. I’ve made it one step further than I have before so I’m going to enjoy it – but I will be coming back tomorrow and hopefully I can play another good game and give myself a chance of progressing even further. In the final match of the day, in-form Frenchman Gregory Gaultier, the No2 seed, beat Egypt’s Tarek Momen 11-5, 11-6, 11-6 to set up a quarter-final clash with Selby.